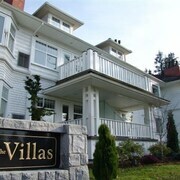 Easy drives to Coombs, Cathedral Grove, Qualicum Beach, Rathtrevor Beach, Cameron Lake, Sprout Lake. Very handy to the beach and to the town centre of Qualicum Beach. 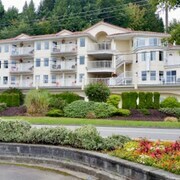 The hotel is across from a public golf course and walking distance to Qualicum beach. 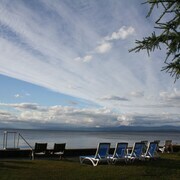 Have stayed here before and still find it's the perfect place to be to enjoy the surrounding area of Qualicum Beach. This motel is quaint and charming. Very cozy and spacious, beautiful view from my patio of the ocean. Very nice veranda on the property with bbq and lots of seating with patio tables and law chairs for sunbathing. Very clean. Nice owners. Close to all amenities. The unit was so well thought out, attractive and comfortable, with everything you could possible need in the kitchen. We had a view of Georgia Straight from our unit, and could walk out to the water. 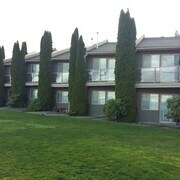 The folks at the property were helpful and friendly. And there were 3 very good eating places just a few minutes walk away. Where to find Qualicum Beach hotels near an airport? Where can I find hotels in Qualicum Beach that are near tourist attractions? Planning to visit Qualicum Beach? Looking for some great hotel options? 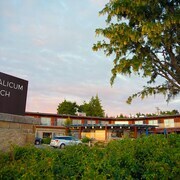 Qualicum Beach has around 13 hotels within a short drive of the heart of town. 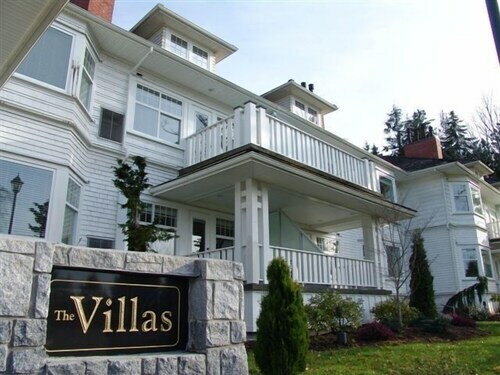 Astute vacationers who fully appreciate the importance of booking accommodation in the heart of town should check out the latest deals at the Crown Mansion Boutique Hotel & Villas and Sand Pebbles Inn, which are within 1 kilometre (0.6 miles) of Qualicum Beach's center. 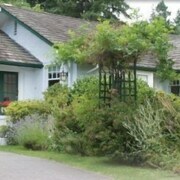 The Qualicum Beach Inn and Tea Cozy Bed & Breakfast are nearest to the Milner Gardens and Woodland, while the La Rosetta Bed & Breakfast and Whitley House Bed & Breakfast are within walking distance of Qualicum Beach Visitor Centre. Those who are in Qualicum Beach for the Qualicum Beach Museum could book a stay at the nearby Shorewater Resort and Ocean Crest Motel. 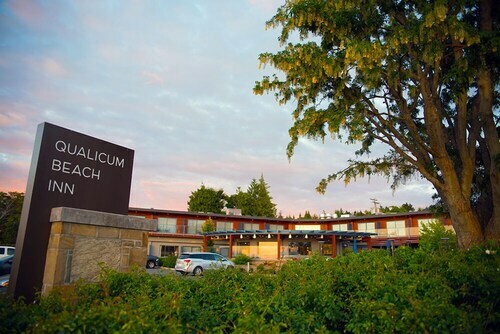 Finally, if you are interested in staying near Qualicum Beach Community Park, your nearby hotel options include the Westerlea Resort Motel and Charm of Qualicum Bed and Breakfast. 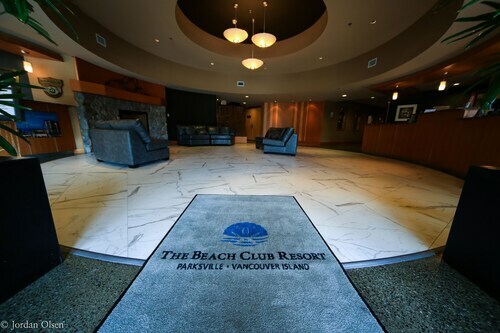 9 kilometres (6 miles) away from the middle of Qualicum Beach, is The Beach Club Resort. The Oceanside Village Resort can be found 13 kilometres (8 miles) away. Other Expedia-listed accommodations include the Tigh-Na-Mara Seaside Spa Resort and the Sunrise Ridge Waterfront Resort. If time allows, you might like to travel to other parts of Vancouver Island. Lovers of the great outdoors will appreciate Vancouver Island's forests, rivers and streams. You should also visit the region's old towns, history museums and open-air museums. Tourists in this part of Canada enjoy snowboarding, skiing and cross-country skiing. Looking for things to do? Why not spend some time discovering the Vancouver Island University Parksville Campus and Riptide Lagoon Adventure Golf in Parksville, 10 kilometres (6 miles) to the east of Qualicum Beach. 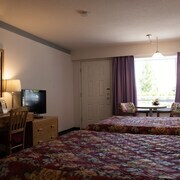 The Travelodge Parksville and Quality Resort Bayside are a few of the Expedia-recommended hotel options in Parksville. 30 kilometres (19 miles) to the west of Qualicum Beach you'll find Port Alberni, home to the Best Western Plus Barclay Hotel and Hospitality Inn. The Alberni Valley Museum and Sproat Lake Petroglyphs are a couple of the popular sites to check out in Port Alberni. Situated 40 kilometres (25 miles) away from Qualicum Beach is Nanaimo Harbour Water Aerodrome Airport. Stay nearby at Coast Bastion Hotel or Marinaside Resort. What are the most popular Qualicum Beach hotels? Are there hotels in other cities near Qualicum Beach? 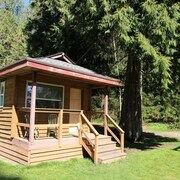 What other types of accommodations are available in Qualicum Beach? Explore Qualicum Beach with Expedia.ca’s Travel Guides to find the best flights, cars, holiday packages and more! Flights from Pierre Elliott Trudeau Intl. to Cozumel Intl. Flights from Macdonald Cartier Intl. to Buffalo Niagara Intl. Flights from Pearson Intl. to Julius Nyerere Intl.